for $468,000 with 4 bedrooms and 3 full baths, 1 half bath. This 3,718 square foot home was built in 2017 on a lot size of 15979 Sqft..
***Gorgeous, WATERFRONT Home, With POOL-SIZED LOT just 10 Minutes from Pearland! Breathtaking Views Nestled in a CUL-DE-SAC. SO Many UPGRADES! 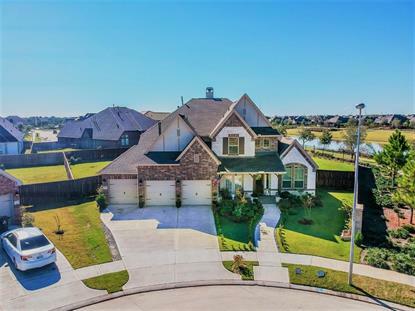 Still Under Builder Warranty with Open Floor Plan, 2 Story Ceilings and Wall of Windows in Family Room, Spacious Kitchen, Upgraded Built-In Stainless Appliances with Double Ovens, Huge Granite Island & Butler's Pantry. Two Master Bedroom Suites on First Floor with Master Bath Retreats for Both. Formal Dining to Entertain, Office With French Double Doors That Open to the Outdoors. Media Room Upstairs is Wired for Your Home-Theater System with Sound Reduction Upgrade. Two Bedrooms on Second Level Feature Jack & Jill Bath. Super Cool Game Room, that leads to Balcony Overlooking the Beautiful Lake and is Perfect for Relaxing and Enjoying the Sunset. Central Vacuum System Throughout Home, as well as Alexa Package. Buyer To Verify Room/Lot Dimensions. Call Today For Your Private Showing! This Community Did Not Flood With Harvey.